The nachos were disappointing. The toppings had been unevenly piled on top of the tortilla chips and that the cheese had hardened and congealed by the time it reached us at the table. Furthermore, the chips tasted packet bought. And here I was expecting homemade chips from ‘an authentic Mexican restaurant’! Nachos shouldn’t be too difficult to get right, but what we were served was reminiscent of nachos served at cheesy margarita bars. We decided to go for some of the more interesting options on the menu, including a grilled napales (a cactus native to Mexico) taco (£3.80) with refried beans, pico de gallo (salsa) and cheese. The corn tacos were very good – tasty, light and soft. The napales were to interesting to try, but they were squishy in texture and a bit bland. This was an average dish. 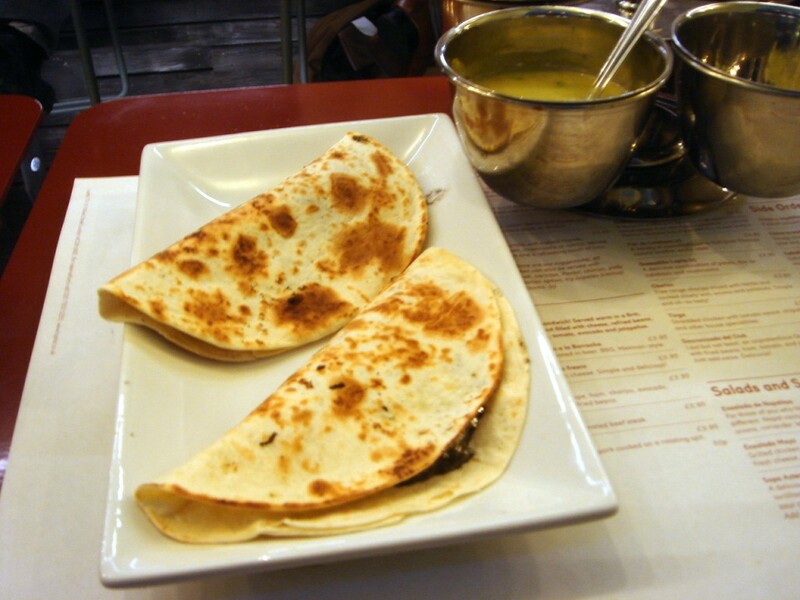 Huitlacoche quesadillas (£4.85) – flour tortillas stuffed with cheese and a Mexican truffle – were not appetising. 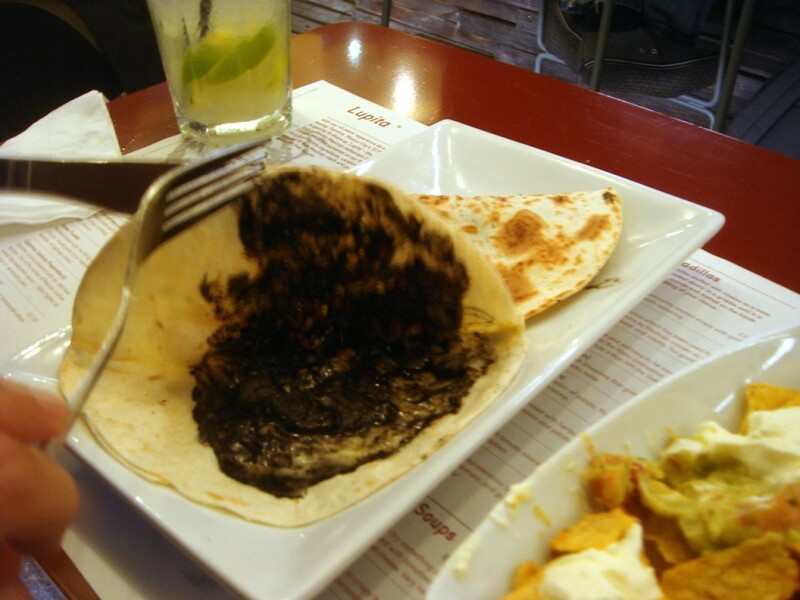 The truffle, applied as a black smear across the tortillas, had a bitter taste to it similar to ‘bad’ mushrooms. I couldn’t stomach this dish and ended up leaving it. The tortillas were good though. Again these were light and soft. 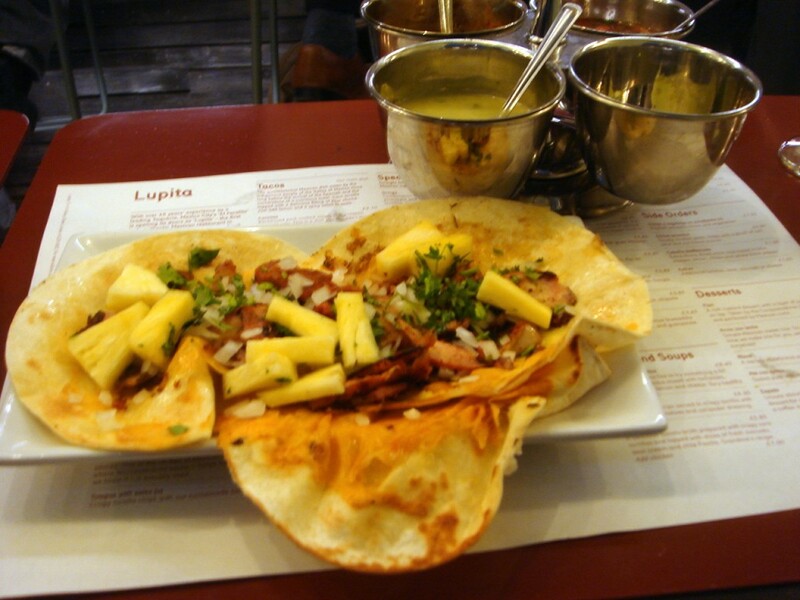 ‘Gringa’ (£5.85) from the specialities list was a dish of rotisserie pork with pineapple served over light, soft flour tortillas. This was the best plate of the evening. The moist and tasty pork was heightened by the gentle acidic sweetness of the pineapple. It was additionally accompanied by cheese, onions, guacamole and salsa which also worked well with the pork. An arachera taco (£4.10) with cuts of marinated beef was pretty tasty. But as the beef was cut quite thin, it easily became overcooked. 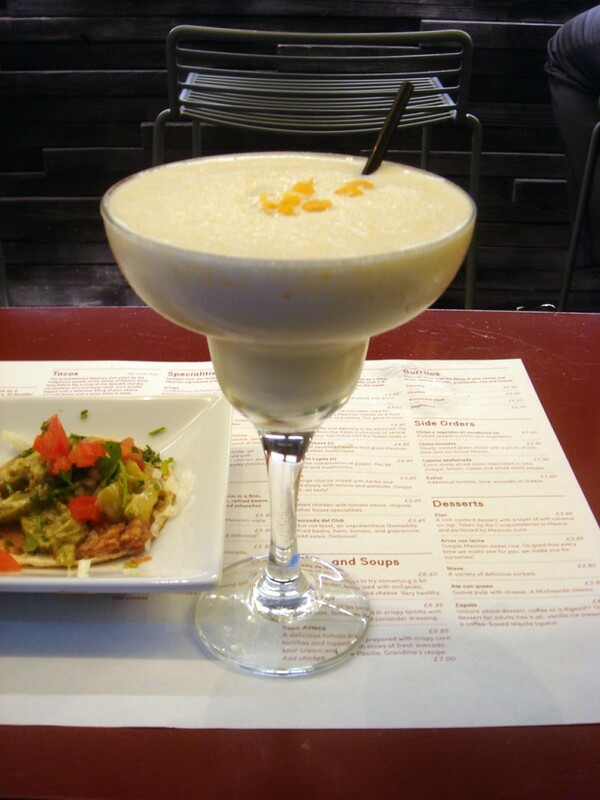 Drinks included a sweet corn margarita. It tasted like a sweet corn milk shake and was slightly odd. The décor is very basic. The seating is uncomfortable – no doubt designed to ensure customers don’t stay too long. If you happen to sit right near the grill, be prepared to come away smelling like a barbeque as the overhead kitchen ventilation wasn’t great. This was a so-so experience. Maybe we didn’t choose right. Average nachos and unpleasant tasting huitlacoche quesadillas certainly didn’t help, nor did the chaotic service. Not only did the restaurant get one of our food orders wrong, we also had a difficult time trying to order drinks. Our waitress was friendly and apologetic, but Lupita probably needed one more person so that they could have managed the Friday night rush better. 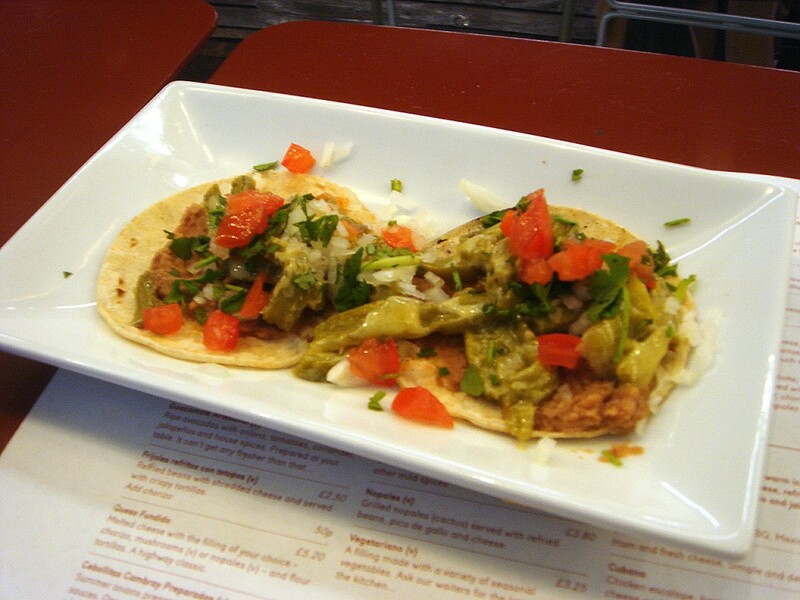 Wahaca still comes up trumps for me in terms of better tasting food, even if it isn’t in the same vein as Lupita. However I do give the latter credit for freshness, trying to introduce uncommon Mexican ingredients to a London menu, wonderfully authentic tacos and flour tortillas, and a very good ‘gringa’. 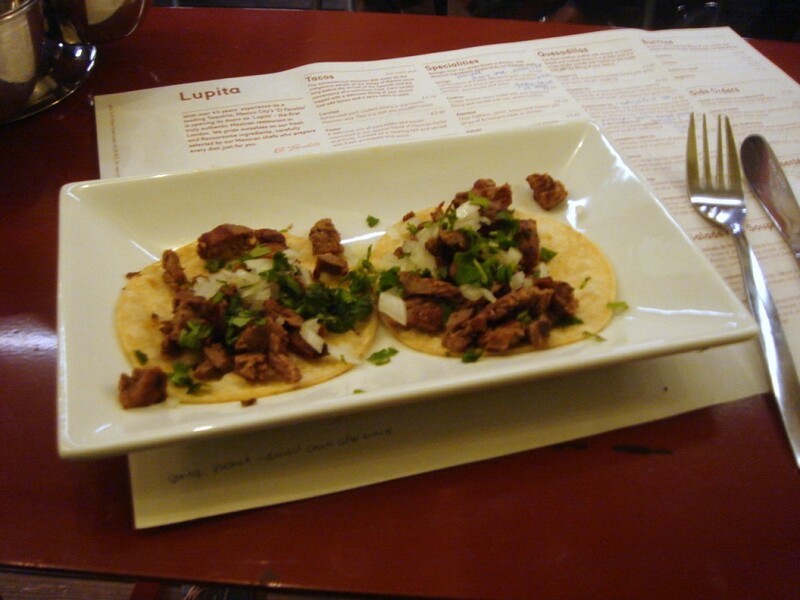 Lupita is hardly a destination restaurant for Mexican food in London, but it’s very reasonably priced. So to put it into context, it’s the kind of place where if you happen to be walking past, then it’s not a bad choice if you’re in the mood for fast, cheap Mexican food. And don’t forget about two great foodie festivals on this week – the London Restaurant Festival (its the second and final week) and Chocolate Week. Price range: £10 to £15 per head, excludes drinks and service. Interesting review. 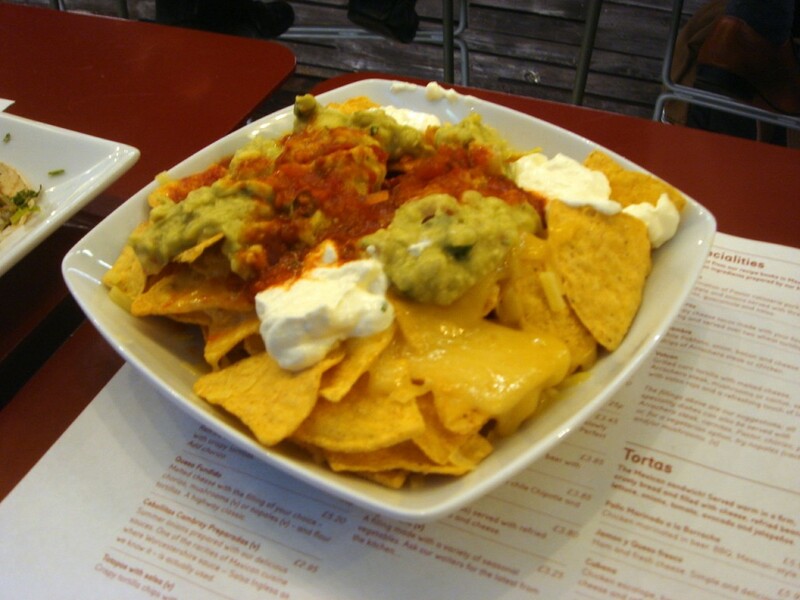 I have just finished a contract with Cantina Laredo and have to say that the chips they serve when you arrive with the home made salsas are light, crunchy and very definitely moreish! These do look alot thicker and as if they could have come from a packet.